ChatBox is Brisbane's biggest home visiting Speech Pathology service. Your child deserves to be heard. Fix sound errors fast with the latest technology and training. FaHCSIA Approved. Experienced, knowledgeable, skilled and trained. We're here to help your child shine. Don't get left behind. Reading is the single most important part of learning for life. Your child deserves a voice. Learn how you are the key to unlock their potential. Brisbane's only home based service. Get results where you need them and make meals fun. 2019 news: ChatBox Speech Pathology have merged with Toowong-based multidisciplinary therapy organisation Active Eight. Active Eight offer a Brisbane Speech Pathology service as well as Occupational Therapy, Physiotherapy, Psychology and a multitude of accessible, inclusive, NDIS-eligible programs for children with disabilities. Active Eight continue the ChatBox mission to help children with delayed language, literacy, pronunciation errors, stutters and social language problems. You can continue to contact us on 07 33710970 for all Active Eight therapy services, or fill out an enrolment form on the Active Eight website to have one of our team contact you. 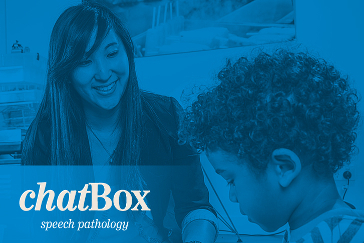 In 2019 ChatBox Brisbane Speech Pathology have merged with multidisciplinary therapy organisation Active Eight and continue to offer expert knowledge, cutting edge technology, skills and experience to make things better for you and your family. Now with Occupational Therapy, Physiotherapy and Psychology home and clinic visits available through Active Eight, collaboration between therapists for children with multiple therapy needs has never been stronger. Our Brisbane speech therapists have experience, passion and love what they do. Your kids will love speech therapy with our therapists! Our Brisbane Speech Pathology service delivers results at home, school and in the community, with superior customer service. In 2019, ChatBox Speech Pathology merged with multidisciplinary therapy organisation Active Eight, who continue to offer speech pathology home visits all over Brisbane as well as clinic appointments at the A8 Therapy Hub in Toowong. ChatBox have merged with Brisbane multidisciplinary therapy service provider Active Eight but our number hasn’t changed! Call Active Eight or fill out a contact form with your details to see how our Brisbane Speech Pathology Service can make things better for you and your child. We’re ready to help. Contact us Today! After many years providing speech pathology services to Brisbane residents, ChatBox has merged with multidisciplinary therapy organisation Active Eight. Active Eight continue to provide Brisbane Speech Pathology services via home visits and a clinic location in Toowong. We remain dedicated to quality speech therapy, results that last and the best customer service; Active Eight offer many additional therapy services including Occupational Therapy and Physiotherapy. With many years of experience providing speech pathology services to children and adults in the Brisbane, Logan and Ipswich areas we have the knowledge, skills and experience to make things better for you and your family. We have speech therapists trusted by hundreds of families in Brisbane, Logan and Ipswich because we deliver results. Call us on 3371 0970 and find out for yourself. ChatBox is a Brisbane Speech Pathology practice. Our speech therapists provide quality speech therapy and customer service. With combined decades of experience providing speech pathology services to children and adults in the Brisbane area we have the knowledge, skills and experience to make things better for you and your family. We have speech and occupational therapists trusted by families because we deliver results. Get in touch and see how good we are for yourself. We provide speech therapy in your home, school, kindergarten; wherever you need us in 150+ suburbs throughout Brisbane. Our commitment to fitting your life, instead of the other way around, means less stress and better speech therapy outcomes for you. We love what we do and we love working with families to make things better. Our speech therapists are dedicated professionals with an incredibly high level of client satisfaction and therapy success. Our job as speech pathologists is to make things better, not keep you coming back. We can’t wait to help you and your family. © 2019 Chatbox – Brisbane Speech Pathology.